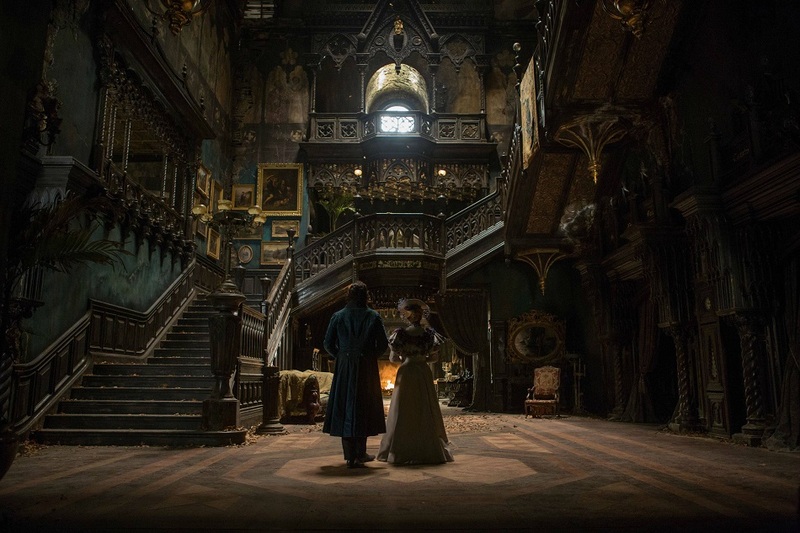 To be sure, Crimson Peak is very much a victory for style over substance with director Guillermo del Toro, in conjunction with production designer Tom Sanders (Dracula, Braveheart) and cinematographer Dan Laustsen constructing a quasi-horror film that looks ravishing; saturated with colour and brimming with ornate gothic architectural influences. Most of the action takes place at Ellerdale Hall, an imposing, run-down Cumbrian mansion that is home to Thomas and Lucille Sharpe, siblings who love each other just a little too much. With the house in disrepair and their fortunes very much on the slide, their only hope lays in extracting the red clay that lays beneath the house (and nowhere else apparently). This is not just any clay mind you; this is a liquid substance that permeates the walls of the house and is slowly consuming the building. Add a naïve bride who sees dead people and the scene is set for all manner of ghostly delights. The ghost-whispering bride is New York socialite and wannabe writer Edith Cushing (Mia Wasikowska) who, following the death of her father in somewhat unsavoury circumstances, marries Thomas (Tom Hiddleston) and takes up residence in Ellerdale. Unbeknownst to Edith, her marriage is merely a ploy by Thomas and Lucille (Jessica Chastain) to secure access to her inheritance. 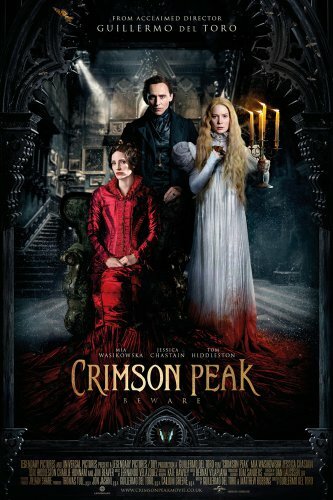 Whilst Crimson Peak is billed as a horror movie, there are no real scares to be had and the ghosts are nothing more than a device through which the sins of the Sharpe’s past are revealed to Edith. Each encounter with the apparitions leads Edith closer to understanding exactly what she has got herself into. Of course, a few contrivances along the way also help her in her search for answers, such as the fact that Thomas and Lucille, despite being so determined to keep the truth from Edith, just happen to leave some important information sitting in a cupboard waiting to be found. Of course, Tom’s insistence that she shouldn’t go into the basement and Lucille’s refusal to give her any keys to the house should have immediately sent Edith scarpering for the exits, but alas she sticks around. It is only when she discovers the exact nature of the relationship between Tom and Lucille that the penny finally drops and prompts Edith to skedaddle. Whilst her character is not real bright, Wasikowska is no dim bulb and she lights up the screen, bringing a likeability to her character that she probably doesn’t deserve. The Aussie actress is always great, often better than the material she has to work with, and that is pretty much the case here. As for rest of the players, Hiddleston is even less animated here than he is playing Loki in the Marvel films, Chastain has little chance to shine as her character remains muchly a mystery and Charlie Hunnam is a far cry from his Sons of Anarchy persona as the kindly doctor who finds himself in the firing line in his bid to rescue Edith. It is rare to find a film that offers such a talented cast so little chance to showcase their talents. From the staircases that seem to stretch upwards forever to the snowdrifts atop the bright red earth, del Toro has certainly created a vision splendid. In fact, it is so lush to look out that you will probably find yourself prepared to overlook shortcomings elsewhere, such as plot, dialogue and characterisation. Yes, Crimson Peak is beautifully atmospheric and there is even a beauty in the ghosts that float through the house, trailing wisps of spectral energy. The influences are obvious – from Hitchcock to German Expressionism to the Hammer horror of the ‘50’s and ‘60’s and even the best of Tim Burton – and del Toro is an avowed fanboy who will make whatever type of film takes his fancy, an attitude that has certainly served Quentin Tarantino well. As long as you don’t expect to be surprised by anything that happens, Crimson Peak is satisfying enough as a campy, colourful period drama set in a creepy ramshackle mansion, but the wait continues for del Toro to again produce something as rich and remarkable as his 2006 masterwork Pan’s Labyrinth.